Organic. For dressings, sauces & marinades. Suitable for coeliacs, vegetarians and vegans. 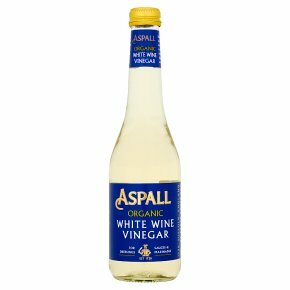 Aspall Organic White Wine Vinegar is produced from the wine of specially selected Organic white grapes. A truly superior White Wine Vinegar with a clean, crisp flavour and a deliciously refreshing zingy fruit aroma. Bottled unpasteurised for a fuller flavour and made using only natural ingredients; so, as the vinegar matures, a slight sediment and darkening may occur. This will not affect the quality of the vinegar. Melt 110g of butter, after it foams and turns brown turn off the heat, add 1 tbsp of Aspall Organic White Wine Vinegar. Add capers, serve with fish.